Oracle’s Primavera P6 Enterprise Project Portfolio Management is the most powerful, robust, and easy-to-use solution for globally prioritizing, planning, managing, and executing projects, programs, and portfolios. Primavera P6 Enterprise Project Portfolio Management is an integrated project portfolio management (PPM) solution comprising role-specific functionality to satisfy each team member's needs, responsibilities, and skills. It provides a single solution for managing projects of any size, adapts to various levels of complexities within a project, and intelligently scales to meet the needs of various roles, functions, or skill levels in your organization and on your project team. 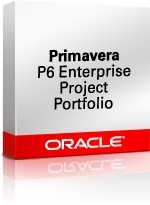 Discover the benefits of Primavera P6 Enterprise Project Portfolio Management.